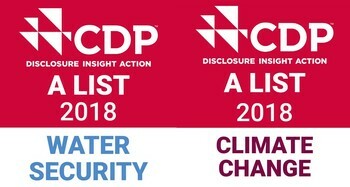 Coca-Cola European Partners (CCEP) has been identified as a global leader on environmental performance and awarded a position on the 2018 CDP A List for Climate Change and Water Security, and Supplier Engagement leader board. This is the third consecutive year CCEP has achieved A List scores, and is one of only 19 companies to be awarded an A for both climate and water in 2018. This achievement is in recognition of its actions to manage environmental risks; cut carbon emissions; enhance water stewardship; and demonstrate best practices associated with environmental leadership, such as setting ambitious and meaningful targets. CDP has also announced its Supplier Engagement leader board, comprising those companies from around the world that have been specifically recognised for their efforts and actions to manage carbon emissions and address climate-related issues across their supply chains. Of over 5,000 companies assessed, CCEP was among the 3% awarded a place on the leader board. Joe Franses, VP of Sustainability for Coca-Cola European Partners, said: “We are continuously looking to drive change, and deliver business growth in a responsible and sustainable way. Being recognised by CDP as one of the world’s leaders in sustainable businesses practices, is something we are very proud of. More information on CDP’s Global Supply Chain Report 2019, “Cascading commitments: Driving upstream action through supply chain engagement” including the full Supplier Engagement leader board can be found here.